The town of East Greenwich was founded in 1677 and consisted of five thousand acres. Four thousand five hundred acres was set aside by vote of the General Assembly for the following men in recognition of services performed during King Phillip's War. Each grant consisted of one house lot and one great division with the whole being 100 acres. Of those only seventeen actually accepted their privilege of drawing farm and house lots. One of which was John Pearce who disposed of his grant by permission of the Assembly to Henry Matteson in 1678. John Spencer*, Thomas Nichols*, Clement Weaver*, Henry Brightman*, George Vaughn*, John Weaver, Charles Macarty*, Thomas Wood*, Thomas Fry*, Benjamin Griffin, Daniel Vaughn*, Thomas Dugin*, John Pearce*, Stephen Peckham, John Crandal, Preserved Pearce, Henry Lilly, John Albro, Samuel Albro, Philip Long*, Richard Knight*, John Peckham, Thomas Peckham, William Clarke, Edward Day, Edward Richmond*, Edward Calvery, John Heath*, Robert Havens, John Strange, Johm Parker, George Browne, Richard Barnes, Samson Balloo, John Remington, Jonathan Devell, Benjamin Mowrey, Joseph Mowrey ,William Wilbour*, Giles Pearce*, James Battey, Benjamin Gorton, Henry Dyre, John Knowles, Stephen Arnold, John Sanford*, William Hawkins and John Houlden. 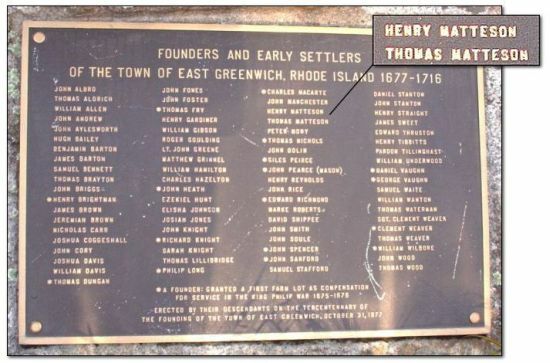 The above plaque was erected in 1977 as part of the 300th Anniversary Celebration of the founding of East Greenwich in front of the old town jail, now the location of the East Greenwich Historic Preservation Society, listing the names of many founders and early settlers of East Greewnwich. 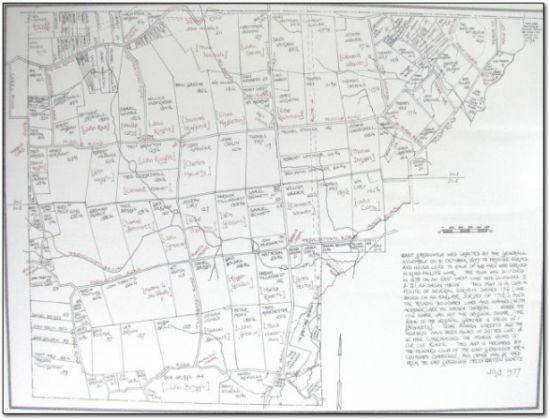 A map was also prepared based upon surveys from 1716 showing where some of the early landowner's property was located. This map may still be available from The East Greenwich Preservation Society.